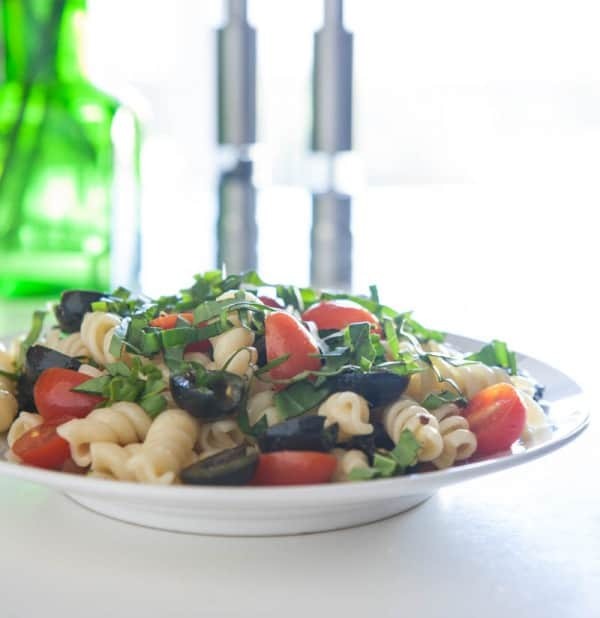 It’s National Pasta Month and I’m partnering with my friends form Dreamfield’s Pasta. Each day this month they’ve invited 31 bloggers from around the country to come up with their most delicious pasta recipes for everyone to share and enjoy. Today I’m sharing with you one of my son’s favorite pasta recipes. It’s a quick and easy family friendly dinner everyone is sure to love. You can keep up with all these amazing recipes by following the hashtag #IHeartDreamfields on social media. Each week has a different theme, and each day has a different cut of pasta, so there’s going to be plenty of delicious recipes to choose form. We’ve been eating Dreamfields pasta for quite some time. It fit’s in perfectly with our diet. In fact, a one-cup cooked serving of Dreamfields pasta (2 oz. dry) provides 5 grams of fiber and 7 grams of protein! It’s also made with premium durum wheat semolina from North Dakota. That’s why it has the same delicious taste and texture of traditional pasta. Pasta is best cooked al dente, or “to the tooth.” Cook only until tender and still firm to the bite. Cooking times vary with different pasta shapes; check package directions. Overcooked pasta is mushy and sticky. Test for doneness about a minute before the cook time is up, draining early if pasta is ready. Pasta will continue to cook after it is drained. Unless you plan to eat it immediately, rinse it in cold water to stop the cooking process. Let it swim! Use at least 4 quarts of water to cook a box of pasta. It needs to move freely in the boiling water to prevent it from sticking. Bring the water to a rolling boil before adding the pasta, and then add the pasta slowly to help keep the water boiling. Stir frequently during cooking to prevent it from sticking together. Salting the water is a personal preference. Adding salt to the cooking water will bring out the natural flavor of pasta. If you decide to salt the water, add about one teaspoon per box right before adding the pasta, when the water is boiling. We recommend pouring any sauce over the pasta just before serving. Sauce too thick? Reserve some of the water the pasta was cooked in and add it slowly to the sauce until the desired consistency is reached. For the best taste and texture experience, pasta should be eaten in one sitting. If you do have leftovers we suggest storing for only one to two days in an airtight container and keeping the pasta separate from the sauce. 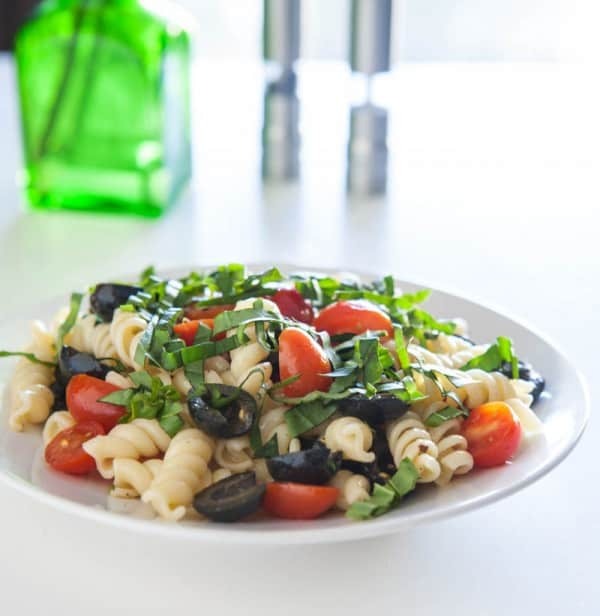 Visit www.DreamfieldsFoods.com to learn more about the brand and get more fantastic pasta recipes. Follow package directions to make pasta. Drain pasta. Salt water if desired. 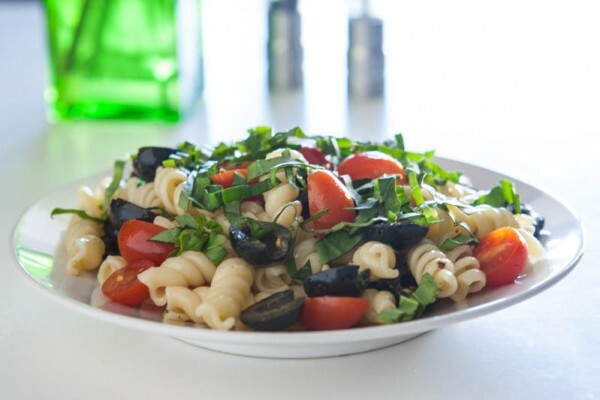 Add olives, tomatoes, olive oil and fresh basil to pasta. Toss well to combine. Season with salt and pepper. Serve. One lucky reader will receive a Dreamfields family pack (one box of each of the 7 cuts of pasta) + $25 gift card! To enter the giveaway just tell me your favorite cut of pasta in the comments section below. My favorite type of pasta is farfalle! I can’t pick a favorite. Just can’t. Love them all. Recently I’ve become a big fan of Rigatoni! Kind of depends on what I am eating but one noodle that I really like for Macaroni and Cheese is Cavatappi. We’ve been using a lot of Lasagna noodles as of lately for roll-ups. Bowtie pasta is my favorite! I like penne because it’s great with meatballs or roasted veggies. My favorite cut of pasta is angel hair pasta. I’m a fan of bow-tie (Farfalle). I love the thick, chewy center and the way the sauce is caught in the folds. It’s so yummy. Love this recipe, Angie! I’d have to say my favorite pasta is angel hair. That’s some good stuff! My favorite is angel hair. I know it technically has the same taste, but in my mind in tastes better. Angel Hair is my favorite as it is very light and tasty. My favorite is mini bowtie pasta. I haven’t tried Dreamfields pasta–thanks for the chance! Rotini is our favorite !!! I like ziti the best and rotini and orzo get second place. Amanda said bowtie and Alison said farfalle — Dreamfield doesn’t make those types do they? I like Angel Hair pasta. My favorite pasta is Rigatoni. I like mini farfalle because it’s so cute. Although I love all the pastas, my favorite is penne. I can’t decide between the rotini and penne. I subscribe to a few food blogs and will add yours to my list. Some sounding great recipes I’d like to try and post to Pinterest. Rotini and angel hair are tied for 1st choice for me. I only use Dreamfields pasta for my health. Would love to see them make rigatoni, shells, bow ties. I even use Dreamfields to make my rice pilaf, by breaking dry angel hair in tiny pieces and then I reverse amounts of rice and pasta so that my carbs are lower– delicious. Thanks for the great recipe- I will be trying this in the next week. I love egg noodles and angle hair pastas. I make a lot of recipes with these two but honestly I have never met a pasta I did not like! We love Dreamfields Penne pasta. I’ll eat any kind of pasta, but my favorite has to be penne. I love love LOVE angel hair! Our favorite is rotini. Great for salads and sauces! Love your recipe! Angel hair pasta is my favorite. I like the elbow pasta in mac & cheese and soups.